Anno Distillers Sloe Gin is a popular Gin available from TheDrinkShop in 70cl to buy online. 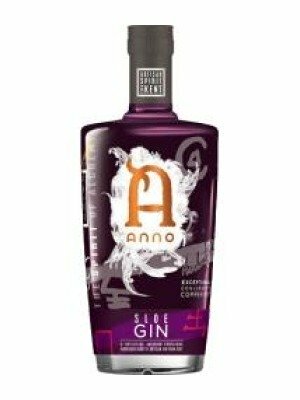 Visit TheDrinkShop for the best price for 70cl of Anno Distillers Sloe Gin or compare prices on our other Gin products. A ruby-red, slightly viscous, liquid that exudes a beautifully deep and rich quality.Nose: A highly aromatic, rich, and fruity bouquet with a distinctively almond nose.Taste: Initially a big berry hit followed by a fantastic nuttiness emerging from the sloe stones. It is also smooth, complex and enticing, with port-like richness.Finish: A long, fruity flavour with a hint of sweetness that slowly smoulders, culminating in deep warmth to the chest. Bottom notes of woodland and floral botanicals coming from the base spirit are also in abundance.Using Anno's award winning Anno Kent Dry Gin as a superb starting point, the distillery added some of the finest sloes available from the beautiful Kent countryside, to create a wonderful concoction sure to delight your senses.Hand-crafted in the Anno Distillers tradition, the team at Kent's first micro-distillery scour the local countryside to obtain the exquisite local botanicals which give their sloe gin that unique taste of Kent; including samphire from the Romney Marsh, lavender from the National Collection at Downderry nursery, and locally foraged elderflower and rose hips.Anno infuse the spirit with handpicked Kentish sloes using a secret method to extract all the flavour from the fruit and the stone, which culminates in perhaps the most extraordinary sloe gin you will ever taste.Anno Sloe Gin is beautifully warming and perfect to be enjoyed neat, perhaps after a long winter's walk or other outdoor activities. It's a very versatile spirit, so can also be enjoyed with soda, lemonade or tonic, or combined perfectly with English sparkling wine or Prosecco for a lovely Sloe Gin Fizz - ideal for a toast at Christmas or on a special occasion. Where to buy Anno Distillers Sloe Gin ? Anno Distillers Sloe Gin Supermarkets & Stockists. You can buy Anno Distillers Sloe Gin online in most retailers and find it in the Gin aisle in supermarkets but we found the best deals online for Anno Distillers Sloe Gin in TheDrinkShop, Amazon.co.uk, and others. Compare the current price of Anno Distillers Sloe Gin in 70cl size in the table of offers below. Simply click on the button to order Anno Distillers Sloe Gin online now.